Judith was born in Datchet and lived with her parents, Samuel and Elizabeth, and younger brother, Stuart, at The Maisonette, on the corner of The Avenue and Southlea Road. Her father, Samuel Osborn, was a surgeon. Her maternal grandfather, who had died before she was born, was Robert Boyd MD, of Bolton Row, Mayfair, and Southall, Middlesex. Samuel, had worked with Sir John Furley and others to establish the British Red Cross Committee. He saw active service in the Greco-Turkish war, when Judith was still a little girl. He went to South Africa on the outbreak of war in 1899, and was mentioned in dispatches. His next service was with the Red Crescent in the Balkan War in 1912-13, and he contributed regularly to medical journals such as The Lancet. It was perhaps no surprise, when WWI was declared, that Samuel started making plans to travel to Belgium. This time, he took his daughter with him. Although the exact details aren’t known, it seems Judith had received some medical training. Women over 20 who became Voluntary Aid Detachment (VAD) nurses were given a few weeks of training by St John Ambulance, This covered basic first aid and home nursing. They were then qualified to work under the guidance of professional nursing sisters, and their duties ranged from changing beds and serving meals to assisting in operations. At the beginning of the war, in August 1914, Samuel took his 28-year-old daughter and two more nurses with him to Belgium along with three surgical dressers. They were to take over a Belgian hospital stationed in a private house at Gembloux, about 50kms south-east of Brussels, but when they arrived they found the village in the possession of the Germans who had advanced so rapidly that they were without medical support. At the request of the Germans, Samuel, Judith and the others, attended to the wounded soldiers for some weeks until the German medical staff arrived. Later they left for Bruges and started another hospital there in the English Convent. 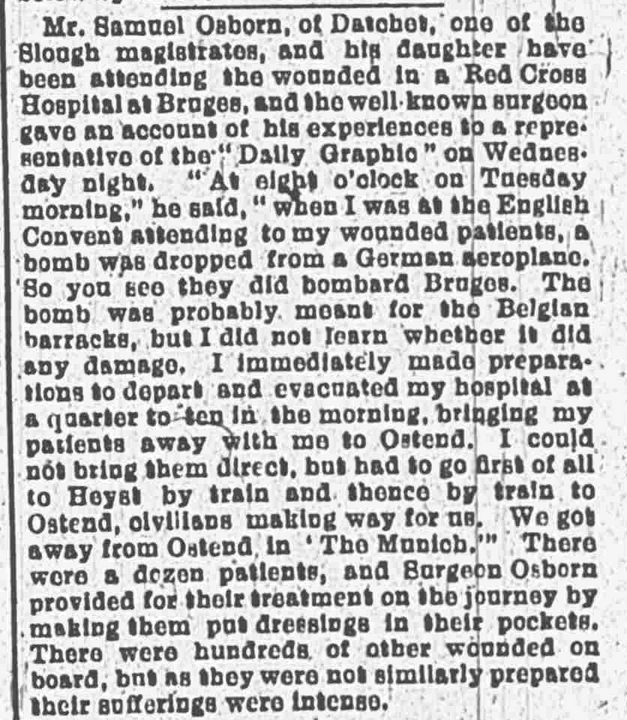 On 17 October 1914, The Slough Eton and Windsor Observer reported that Samuel and Judith had been attending the wounded in a Red Cross Hospital in Bruges. Samuel told a reporter from the Daily Graphic that ‘At eight o’clock on Tuesday morning, when I was at the English Convent attending to my wounded patients, a bomb was dropped from a German aeroplane. So you see they did bombard Bruges. The bomb was probably meant for the Belgian barracks but I did not learn whether it did any damage. I immediately made preparations to depart and evacuated my hospital at a quarter to ten in the morning, bringing my patents away with me to Ostend. I could not bring them direct but had to go first of all to Heyst by train and thence by train to Ostend, civilians making way for us. 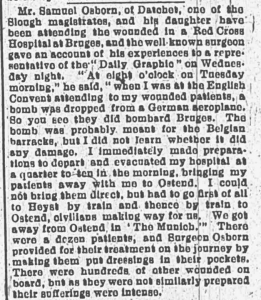 We got away from Ostend in ‘The Munich’.” Samuel had made the dozen patients put dressings in their pockets so they could be treated en route. There were hundreds of other wounded on board but, as the reporter notes ‘as they were not similarly prepared their sufferings were intense’. Lady Manners was the beautiful and very glamorous socialite Diana Manners, later Lady Diana Cooper. She served as a nurse in the Volunteer Aid Detachment during World War I. From early 1916, Samuel was in charge of Lady Dundonald’s hospital in Eaton Square, London. 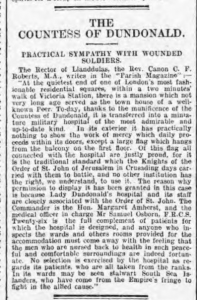 The North Wales Chronicle ran an article, left, about the hospital on Friday 8 September 1916. 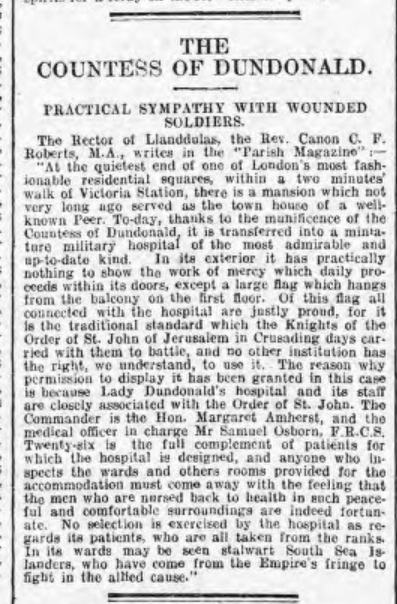 It explained that Samuel Osborn, FRCS, was the medical officer in charge and that there were 26 beds in the mansion at the ‘quieter end of one of London’s most fashionable residential squares, within a two minutes’ walk of Victoria Station’. The hospital was open until August 1917. 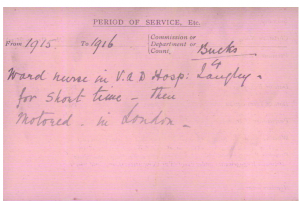 Meanwhile, his son Stuart had received his commission in November 1916. He became a lieutenant with the Royal Garrison Artillery (regimental number 157944). He was awarded the Military Cross and was mentioned in despatches. Around this time, Judith was working in Langley. 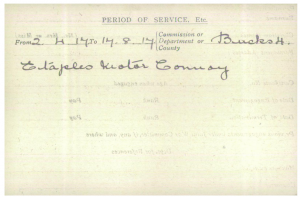 Red Cross records show that she was a ward nurse, and that she had worked 100 hours in 1915 and 1916 in the Voluntary Aid Detachment Hospital there. 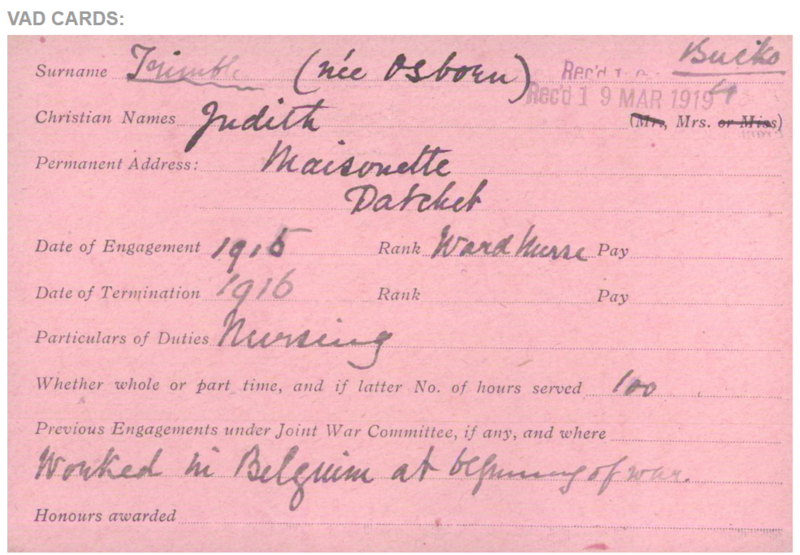 The records also note that she worked in Belgium at the beginning of the war. Perhaps in search of a greater challenge, it wasn’t long before Judith took up another role. 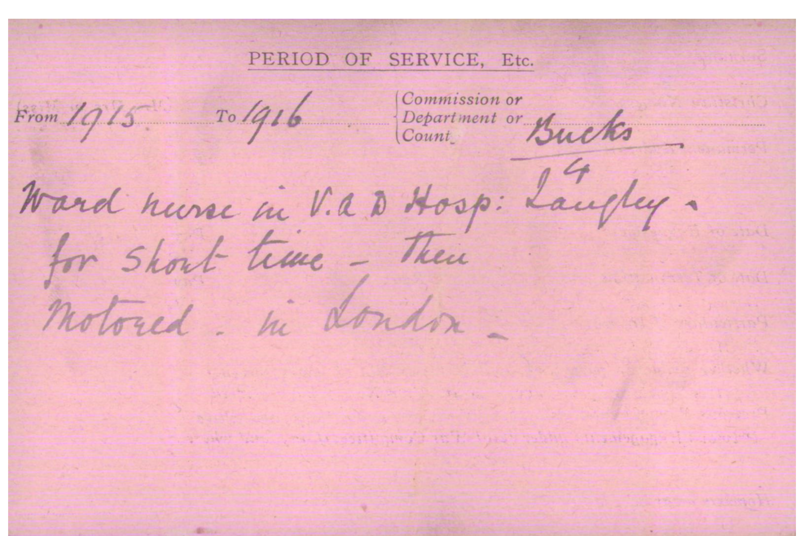 The Red Cross records indicate that after a short time as a ward nurse she ‘then motored in London’. The first motorised ambulances appeared during WWI. 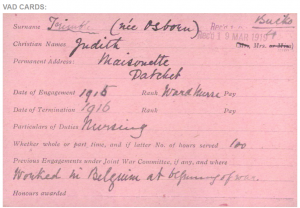 Subsequent Red Cross records, below, show that from April to August 1917, Judith was a chauffeuse, a driver, for the Etaples Motor Ambulance Convoy. A part of her role would have included included unloading wounded soldiers from the trains. The drivers were also required to maintain the vehicles. 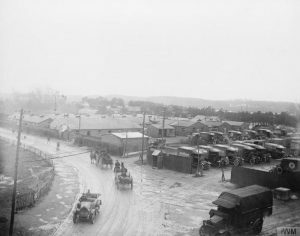 Judith left the Etaples Motor Convoy on 18 August 1917. 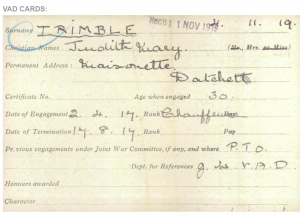 And on 1 September, at St Mary’s Church in Datchet, she married Lieutenant-Colonel John Brereton Owst Trimble, son of the late Deputy Inspector-General J Trimble and Mrs Trible of Merstham, Surrey. Their marriage was announced in The Times. Born in Kent in 1881, John was five years older than Judith. His father had been a naval officer and some of his older siblings had been born in Bermuda. John had been a regular officer before the war. 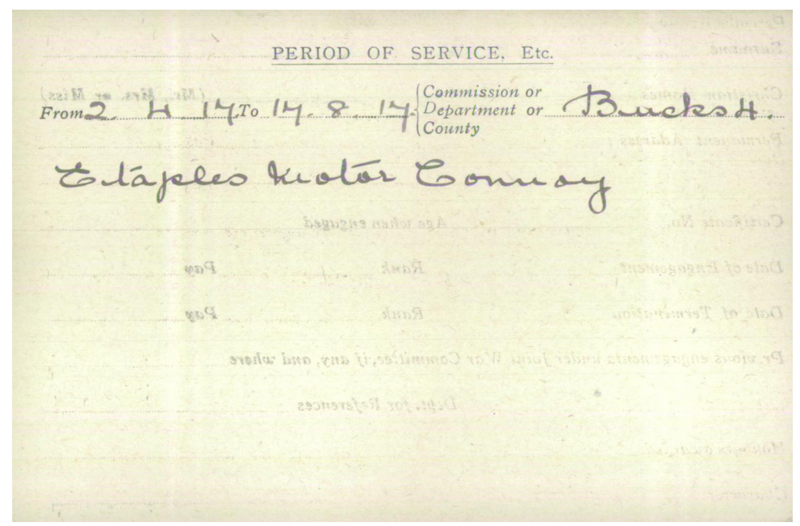 He had received his first commission in early 1901 and served in South Africa with the East Yorkshire Regiment. By the time war broke out, he had been promoted to Captain and by January 1916 had become a Major. He served for a time as Second in Command of a Service Battalion of the Yorks & Lancaster Regiment. He then became Commanding Officer of the 11th East Yorkshire Regiment. In 1917 he commanded the 9th Battalion of the Norfolk, then the 9th Battalion of the Suffolk Regiment, then the 5th Battalion of the Leicestershire Regiment. In November that year, he returned to the 1st Battalion East Yorkshire Regiment, and in May 1918 he transferred as a temporary Lieutenant Colonel in the Machine Gun Corps and was later wounded. In addition to the 1914-15 Star, the British War Medal and the Victory medal, John received the DSO (Distinguished Service Order) and MC (Military Cross). At the end of the war he stayed in the army and reverted to the rank of Major. He was awarded an OBE in 1926. The announcement in the London Gazette referred to him as “Major John Brereton Owst Trimble, DSO, MC, The East Yorkshire Regiment, lately Commandant, Machine Gun School, India”. (The Army List shows him at the Machine Gun School in Ahmednagar, 250kms east of Mumbai, in October 1924.) We haven’t yet discovered if Judith was also in India although this seems likely. Some military wives took on voluntary work such as nursing and teaching there. Judith and John had a son, Christopher John Osborn Trimble. His birth was registered in Eton in early 1920. 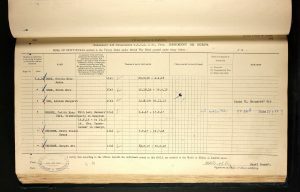 In July 1932, passenger records show that he travelled aboard MS Indrapoera, with his 80-year-old grandfather, Samuel Osborn, from Southampton to Morocco. The ship was bound for the Dutch East Indies. Could it have been stopping in India en route? If so, perhaps Samuel was escorting Christopher to visit his parents during the school summer holidays? 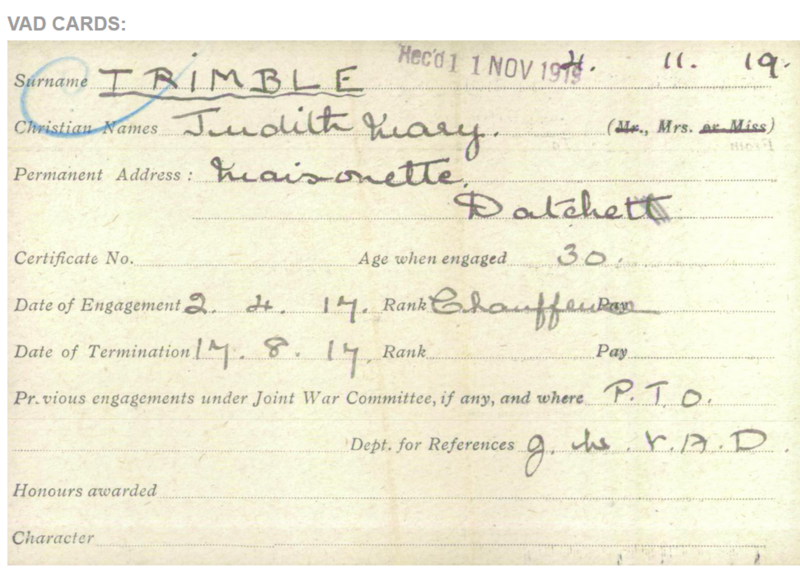 John Trimble died in January 1947. 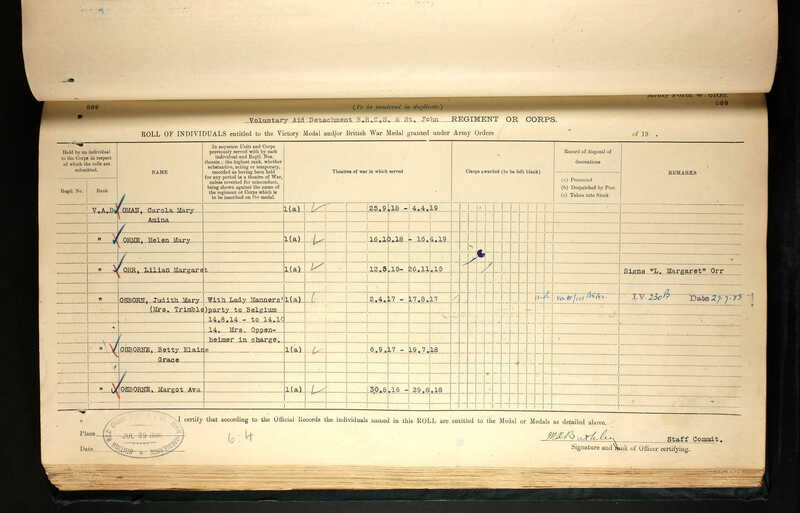 His probate records list him as John Brereton Owst Trimble, DSO, OBE, MC, of Beacon House, Pinhoe, Devonshire. Judith died in September 1949. Her address was given as 42 Cheniston Gardens, Kensington. Probate was granted to Waller Clark Hall, Captain, Royal Navy, and Mrs Mary Nassau Stuart Smith.